Immigrant-rights activists staged an attempt to block the road to federal immigration agents’ headquarters in Atlanta on Monday June 27, 2016, demanding President Obama to stop the deportation of undocumented immigrants and families after last week’s Supreme Court decision ended in a 4-4 draw. 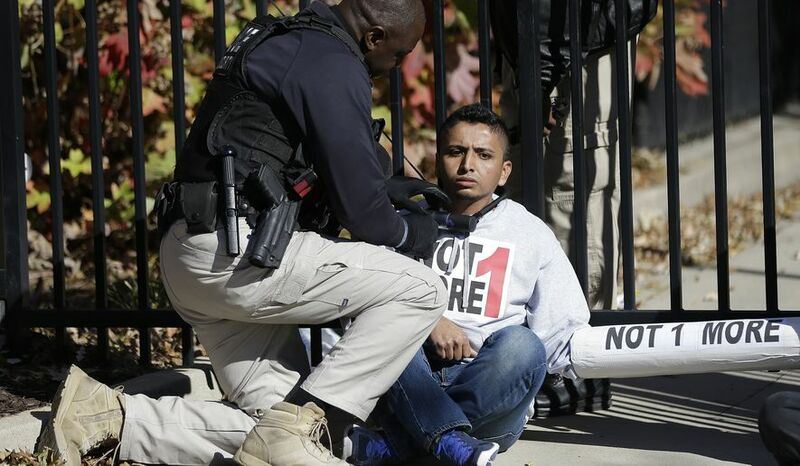 The protest was led by a leading immigrant activist group called Not1More. The whole protest was telecasted on the web through their platforms, the demonstrators called on Mr. Obama to condemn the Immigration and Customs Enforcement (ICE), the deportation agency. They also mentioned that it is upto the administration to protect the undocumented immigrants now. The Supreme Court issued a 4-4 tie on Mr. Obama’s executive order, which would have provided temporary legal status and work permit to as many as 5 million illegal immigrants. Speaking after the decision, Mr. Obama mentioned that his hands are tied and he will not try to enforce any other immigration actions for the remainder of his term. The activists however think and want him to do more, that is to stop the deportation of undocumented immigrants and families.